candidate Brandon Cleary and son Logan. Town Council candidate Ron Russo in background, left. 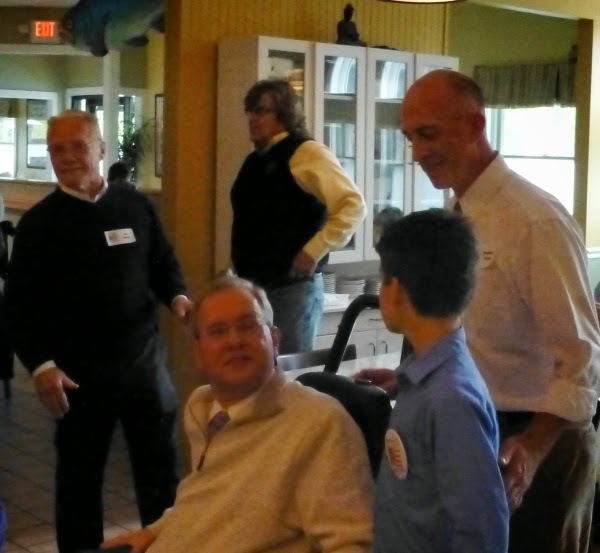 Our candidates were pleased to have conversations with a number of voters and we were honored to have U.S. Representative Jim Langevin visit on Saturday. The rain washed out his plans for door-to-door canvassing visits with Donna Walsh and some of our Council candidates but Langevin still attended our Snack & Chat event at The Breachway Grill. The pizza was great and, before we knew it, we had run over our planned 4 pm end time.